Behold the wrathful countenance of the whip scorpion! More specifically, this is a tailless whip scorpion, from which its scientific name of Amblypigid is derived. What does amblypigid mean? It's Latin for 'blunt rump.' Hmm. I never thought I'd have something in common with an arachnid before. Whip scorpions are also called whip spiders, which is actually a more appropriate name. See this here chart to see where they belong in the arachnid family. UPDATE: I have been corrected. Again. This does not show the relationship of the various groups of arachnida. Rather, it simply lists them alphabetically. This is the danger when you blog in ignorance. I simply happened to guess right when I said that whip scorpions are more closely related to spiders than to true scorpions. Oh those things are so creepy! 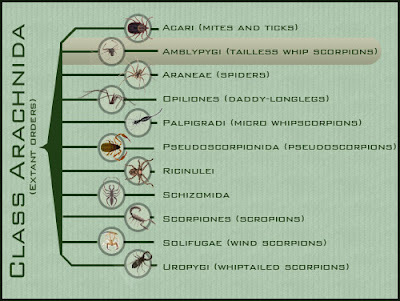 While you got lucky in saying that tailless whip scorpions are more closely related to spiders than to scorpions, notice that looking at tailless whip scorpions and whiptailed scorpions in your diagram would lead to the wrong conclusion (as an example). If they don't have a tail (or at least much of a tail) how do they go about stabbing prey? I must say, the name 'whip scorpion' implies that it has a significant tail, for say, whipping... Thus, I'm confused by the logic behind the common name. I don't care who they are related to. They are still ugly!